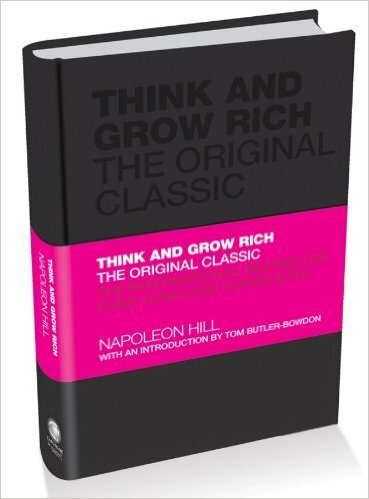 Some years ago, when I was just getting into the personal development literature, I found myself an old copy of Think and Grow Rich in a second hand books store. It was a battered 1960 paperback edition, published by Fawcett Crest, New York. There must be hundreds of thousands, if not millions, of copies like mine around the world. For so many people it is a treasured book. But why, exactly? Despite its fame, not much has actually been written about the book. You will find a few mentions in various tomes on the history of the motivational field, and a few short pieces on the Internet (such as Wikipedia’s entry), but considering this is a work reputed to have sold 15 million copies I was surprised there wasn’t more. So when Capstone/Wiley publishing asked me to be the editor on a new series of older self-development classics, with the first one being Think and Grow Rich, I didn’t hesitate to become involved. Here was a chance to research the story of the book’s creation and delve into the life story of Napoleon Hill, its author. Part of that story is how Think and Grow Rich came to be the title of Hill’s manuscript. His publisher, Albert Lewis Pelton, had wanted to call it Use Your Noodle to Get More Boodle (or something like that) but thankfully Hill prevailed. Does the book live up to its title? Does it really work? It does, depending on how much the reader puts into it, and we should be continually reminded of the first word of the title: Think. No one can do this for us. However, I personally know two millionaires many times over who ascribe much of their fortunes to having read, studied and put into effect the lessons in Think and Grow Rich quite early on in their lives. It might be a hubristic title, but for them and many others there is ‘something’ to this book that inspires people to surpass their own expectations of themselves. Anyone who has read the book knows that Hill frequently alludes to a ‘secret’ that contains the essence of wealth creation and success – but he never actually spells it out. Like many others, I always wanted to know what this secret was but could never put my finger on it. Then, quite by accident, and while researching my Introduction for the new edition, I found reference to the secret in another of Hill’s books. In it, he states the secret clearly, and I’m pleased to reveal it in my Introduction to the new edition. If you haven’t read Think and Grow Rich, you should. If you already have, perhaps you'd like to update to this new edition, which is bound in hardback and is the complete, original 1937 text, running to 384 pages. There have been quite a few ‘modernised’ and ‘abridged’ versions, but they cut out some of the interesting historical details and, I believe, reduce the book’s power. Below is an excerpt from my 4,500 word Intro. America in 1908 was an exciting place. Henry Ford had ushered in the automobile age with the production of the first Model Ts, the Wright brothers were doing the same for flight when they kept a craft in the air for two hours, and the motion picture industry was just getting started.The country was in a short, sharp recession following a financial panic but would soon recover. There was still much optimism. In the Autumn of that year, young reporter Napoleon Hill was asked by a magazine to write a series on major business figures, with his first subject the great steel magnate Andrew Carnegie. Now the richest person in America after the sale of his massive interests, Carnegie was in the process of giving away his fortune in history’s greatest act of philanthropy. When a nervous Hill walked into the grand library of Carnegie’s 5th Avenue New York mansion, he expected the interview to last for an hour or two. Carnegie asked him to stay for the weekend. The wily Scot, who had come to America with nothing, had grown excited as he expounded on the idea that there should be a concrete ‘philosophy of success’ for the average person, drawn from the experience of great achievers. When Carnegie suddenly challenged him to spend the next 20 years formularising this philosophy, Hill was taken aback. But perhaps imagining a secure career in fascinating research bankrolled by a billionaire, Hill (according to his unpublished autobiography) took only 29 seconds to say ‘Yes’. It was a golden opportunity, but in some ways Hill deserved it. In his 24 years he had notched up some remarkable achievements. Born in 1883, he had been one of the wild boys of Wise County in the foothills of the Appalachians, and after his mother’s death at only nine the future did not look bright for a delinquent with little wish for self-improvement. Yet when James Hill remarried, Napoleon’s new stepmother proved to be a godsend. She bought him a typewriter and persuaded him to use it, promising that writing skills would one day make him rich, respected and famous. After a hated, physically exhausting stint in a coal mine he began to see the value of using his mind to progress in life, and at 15 was already contributing stories for local newspapers. Then followed business college, managing a mine employing 350 men, a brief period in law school and, after proving to be a whiz as a salesman, being made partner in a lumber company – an impressive resume for someone raised in the cultural and material poverty of rural Virginia. It was after the stock market plunge of 1907, which led to the lumber firm being bankrupted, that Hill again found himself working as a reporter. The Carnegie project may have seemed to Hill like his great calling, but there was a shock to come. Despite his vast wealth, Carnegie would not fund the project, noting that Hill’s chief reward would be the satisfaction of knowing that he would change many lives, and that the results of his research would anyway bring fame and riches. Hill’s disappointment was mitigated to some extent when, to get the project off to a good start, the steel king offered to provide letters of introduction to some famous friends including Henry Ford. Click to see reviews or buy.